Monstar is just layer upon layers of emotional goodness which extends out from all sides to ensnare the members of Color Bar all in their individual and interconnected angst. Episode 8 almost blew the lid off the simmering pot, almost but not quite yet. I’m pretty in awe of the writer-PD combo here, having worked together on Sungkyunkwan Scandal which was admittedly a youthful refreshing sageuk initially but narratively melted down for me towards the end. Here they are working with so much less and doing so much more, in eight short episodes creating a fully realized universe of characters I care about. Turns out Do Nam and Kyu Dong wasn’t a misunderstanding inasmuch as a youthful folly that results in an unfortunate accident. I don’t begrudge Do Nam for being angry still since Kyu Dong never apologized before, but perhaps one door closing in his judo career is the chance for another to open in a music one. I think Kyu Dong’s angst is everything combined and isn’t going to be solved just by Do Nam forgiving him, but I sure hope that boy didn’t jump off the ledge at the end of episode 8. That was a cruel way to end an episode, especially so considering this is a youth music drama. Wowsers, but it did give Seol Chan the most heartbreaking look of worry and anguish when he caught a crying Se Yi in his arms, all of his earlier frustration and problems evaporates in the face of her need. I’ve already written about the OTP’s perfect movie-guitar date and this better not be the only duet from these two in this drama. Yong Jun Hyung‘s acapella singing voice was amazing, he’s sorta hiding his talents being the rapper of his group, but when Ha Yeon Soo‘s voice joined in I about died of happiness because it was so perfect together. This was the episode that made me hella annoyed at Sun Woo, but then I also liked him more because he’s stopped thinking so much and started acting out his feelings and being a jerk at times. Finally all the kids are acting like kids, with tears, fears, and anguish starting to bubble forth which means finally people will be dealing with their issues instead of hiding it away. 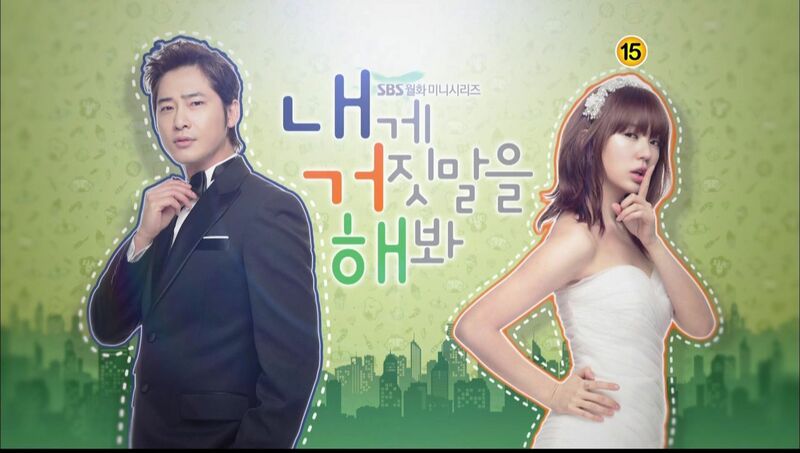 Sun Woo’s two big problems are his misunderstanding with Seol Chan and his wish not to be rejected again by Se Yi. He can fix the former but the latter is beyond his control. Se Yi clearly has feelings for Seol Chan, and none whatsoever for Sun Woo, but that doesn’t mean she’s ready or willing to act on it. Especially when Seol Chan is still being a Star around her and confusing the heck out of her with his “be my girlfriend for a day” followed by “she’s not my girlfriend”. Forget clueless Se Yi, any woman would get whiplash around him. I need my Star boy to realize that Se Yi is worth fighting for, and that he can have a career and a personal life as well. If he doesn’t try, then he’s only going to have regrets, much like Ji Woong and Se Yi’s mom. I’m sure history won’t repeat itself, but gosh darn it watching all this angst in between is making my heart hurt way more than I signed up for. Color Bar finishes their performance to the wild applause of the audience. Hyo Rin turns to her brother Joon Hee and declares that she wants Seol Chan. Sleazy witch, get your dirty mitts off our Star!. Teacher Choi muses that its going to be hard for the Principal to pick the victor. 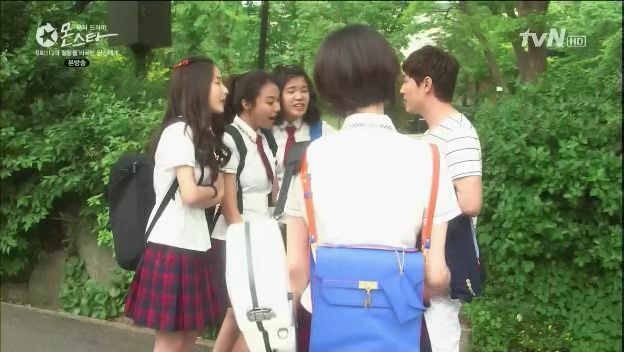 Seol Chan leads the group outside and is immediately mobbed by fangirls. He stops to sign autographs. As the group waits for the decision, Na Na heads to the roof for a breather. She takes out a cigarette but pauses before lighting it and flashing back to the rest of her conversation with Sun Woo in her fashion studio. He claimed that he doesn’t see the daughter of a gangster and a salon room manager. He sees Kim Na Na, a great singer and a member of Color Bar. She asks if that is true? But didn’t he also say that he doesn’t believe in anything he can’t see? Na Na asks Sun Woo to hang out with her for ten times before she will believe him and go to the performance. Sun Woo walks up to Na Na on the roof and confirms that he agreed to play with her ten times and he’ll do it. All she needs to do is tell him when and where. He takes her cigarette and says that she’s not allowed to do this when they are hanging out. The members of Color Bar and All for One sit side by side in the auditorium waiting for the verdict. Predictably the Principal chooses All for One, and is promptly boo’d. All for One march out and shoot victorious glances at the stone-faced Color Bar members. Do Nam breaks the silence and angrily reminds Seol Chan that he promised they would win. He storms off followed by Na Na and Sun Woo silently leaving. Eun Ha stops in front of Seol Chan and gives her oppa a thumbs up sign saying that he was amazing today. That elicits a small smile from Seol Chan. Seol Chan leaves and looks back to see Kyu Dong and Se Yi still sitting there. She’s worried that they lost and Kyu Dong is sad but he’s not. He was happy to have performed for the audience who clapped for Park Kyu Dong and not bullied Radio. Seol Chan notes that and then walks out. Manager Hong drives Seol Chan home and is happily that the performance has generated great positive buzz for Seol Chan despite his team losing. 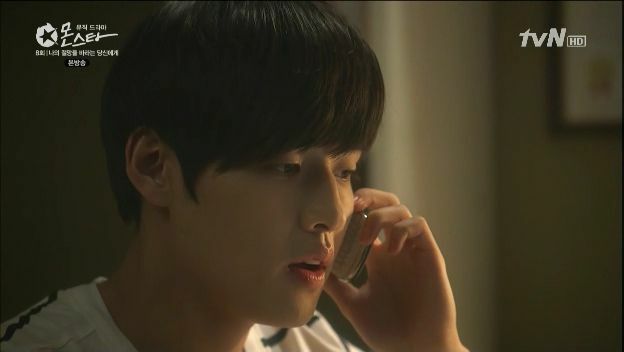 Seol Chan goes home and takes out his phone, itching to call Se Yi but hesitating. 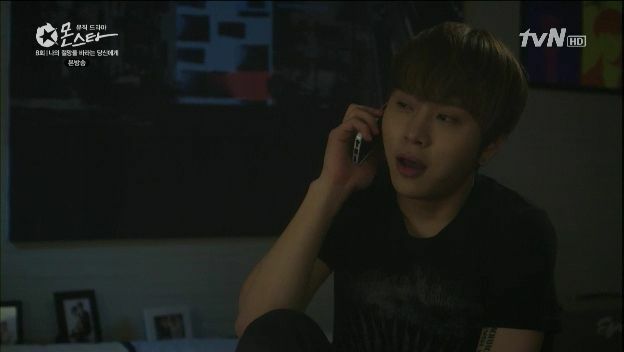 You can see that he’s hung up the framed note from Se Yi and stuck a spotlight on it. Se Yi is at home thinking about Seol Chan and how this loss must be bringing him now, especially since he was so confident they would win. She take out her phone to call him but also hesitates. Se Yi is about to dial Seol Chan when she gets a call from Sun Woo. He wonders if she’s sad about their loss and is about to invite her out tomorrow since its Sunday when Se Yi gets a call from Seol Chan so she asks Sun Woo to stay on hold and switches over to answer it. Seol Chan is happy she picked up but falls back on his usual jerky facade with her and yells at her for checking that Kyu Dong was fine with their before and not even concerned about him. He’s her partners, so shouldn’t she be concerned about his welfare? He claims that he’s in such a crappy mood by the loss he wants to see a movie tomorrow and needs someone to keep him company. Se Yi thinks he has tons of friends, or if not then Manager Hong. Seol Chan keeps playing the partner card until Se Yi yells that she doesn’t want to and hangs up. Se Yi then realizes that she’s hung up on both guys, which is when a call comes in and she answers and yells out that she doesn’t want to. Turns out its Sun Woo so she quickly apologizes. He asks her to go see a movie tomorrow and she makes an excuse that she’s busy at home. He understands and ends the call. Se Yi is still annoyed Seol Chan kept pushing her to go when he ought to have tons of friends to go with. She then flashes back to their first meeting when fans surrounded his van. This triggers a memory and she calls Seol Chan back and agrees to go with him. Adorable Seol Chan scrambles to grab the phone and stubs his foot but manages to make it sound like he already made other arrangements but will cancel it since she’s going now. Se Yi waits for Seol Chan outside the movie theater. Suddenly a finger taps her arm and she looks up to see sunglasses-wearing Seol Chan smiling down at her. 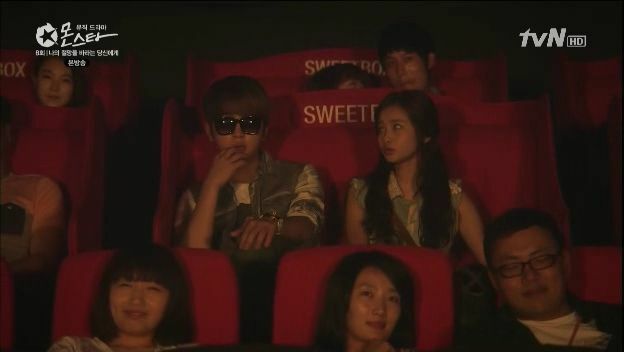 They end up in a couples seat in the theater which even Se Yi knows costs more. Seol Chan whips out his Star status and pushes her to just sit back and enjoy it. 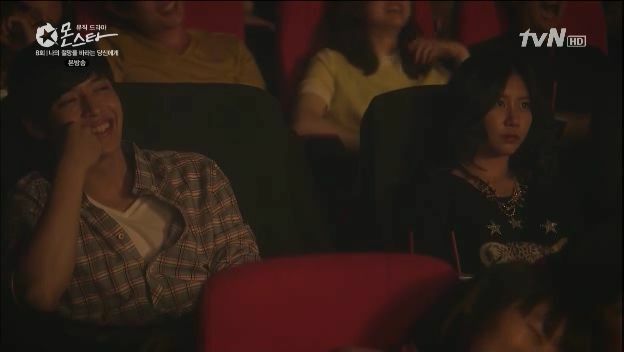 He ends up staring at her as she happily watches the movie (Kim Soo Hyun’s Covertly Grandly). Elsewhere, Sun Woo is at home when he gets a call from Na Na. She enters a bookstore and sees him standing there flipping through a book. She’s surprised he really came and then marks off one line on his arm with a pen to signal the first of their ten times hanging out. 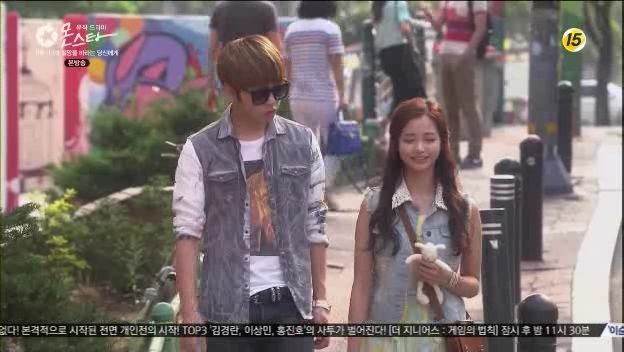 Sun Woo and Na Na head to the same cafe he took Se Yi to and they also order tons of desserts. Na Na asks why he agreed to hang out with her since this is totally not the behavior of the usual Jung Sun Woo, class president. Sun Woo admits he’s being considerate of her situation and only stepped in because he could see she really needed it. In the past, he once stepped up for a friend he thought was in need and it turned out all wrong, which made him wary of being someone who tries to help. But now he’s trying to find his way back. 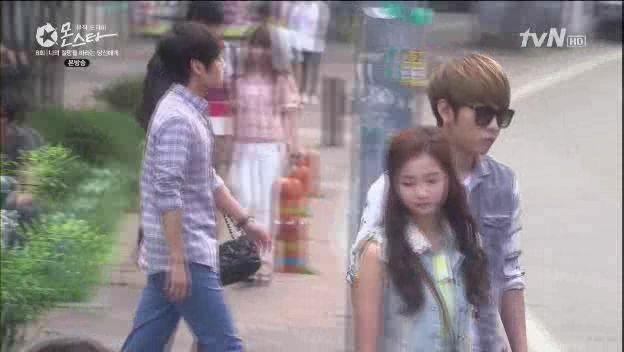 Sun Woo and Na Na walk out of the cafe and literally brush past Se Yi and Seol Chan. The latter pass by a street vendor and Se Yi notices a cute stuffed sheep and bends down to pick it up. Seol Chan wonders how much she loves sheep. Se Yi already has plenty of sheep stuffed animals so she leaves it there and leaves. 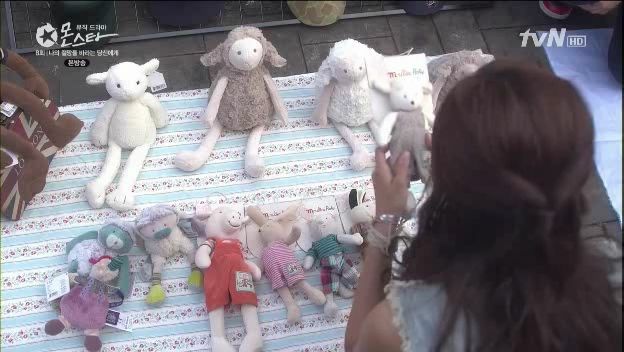 Seol Chan pauses, and the next thing he’s shoving that sheep in her hands after buying it. Seol Chan makes up an excuse to give it to her and when she declines he tells her to consider it as a proxy for a boyfriend. It’s her boyfriend sheep and when she gets a real boyfriend she can give it back to him. Se Yi accepts with a smile. 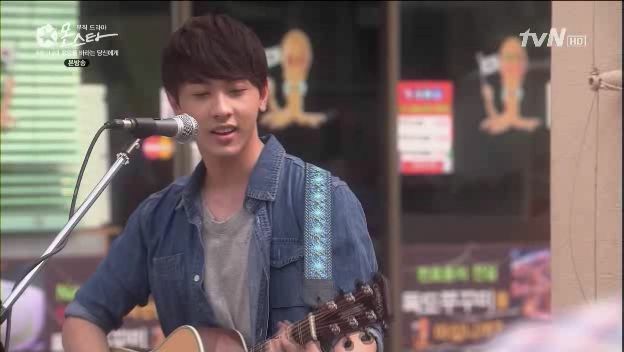 Sun Woo and Na Na pass by the same street performer (rising Thai singer Natthew) that Sun Woo watched perform before. After they leave, Seol Chan and Se Yi walk up and she’s especially taken with his guitar performance, which incites Seol Chan’s jealousy since he’s plays keyboard rather than string instruments. Seol Chan asks if she thinks guitar playing guys are cool, isn’t the piano cooler? Se Yi says he father playing the guitar was the coolest man she’s ever seen. When he played, he seemed to be a figure of quiet strength. There are people who are lonely because they don’t have anyone but need someone, there are those who are obscured because they push others away, and there was her dad, a man who was cool and confident being alone. Seol Chan asks if its hard to learn the guitar and Se Yi can read between the lines and sees that he’s interested in learning. Seol Chan says no way, he’s much too busy to have anytime for this silliness but Se Yi can tell that her description of her dad playing the guitar piqued his interest. She drags him off to learn. Se Yi takes Seol Chan to a guitar store owned by an ahjusshi who remembers Se Yi as the New Zealand sheep girl. She asks to borrow a guitar for a day to teach her friend her the guitar since he wants to learn. The ahjusshi says Seol Chan looks like someone who can sing and tells Se Yi to pick out a guitar for her boyfriend and use the inside studio. Inside the studio, Seol Chan strums the guitar and Se Yi tries to teach him and asks him to pluck the chords and sing a song. 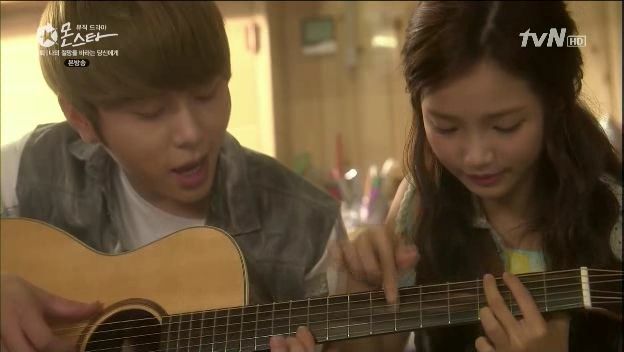 Seol Chan and Se Yi end up doing a lovely duet when he plays the body and she strums the head of the guitar and taps out a beat on the frame. During the duet Seol Chan just stares and stares at Se Yi while she’s immersed in the collaborative playing. 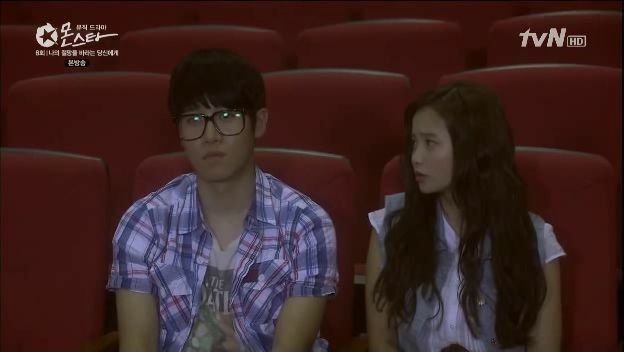 During the duet, the scene cuts to Na Na and Sun Woo watching the same movie Se Yi and Seol Chan saw. 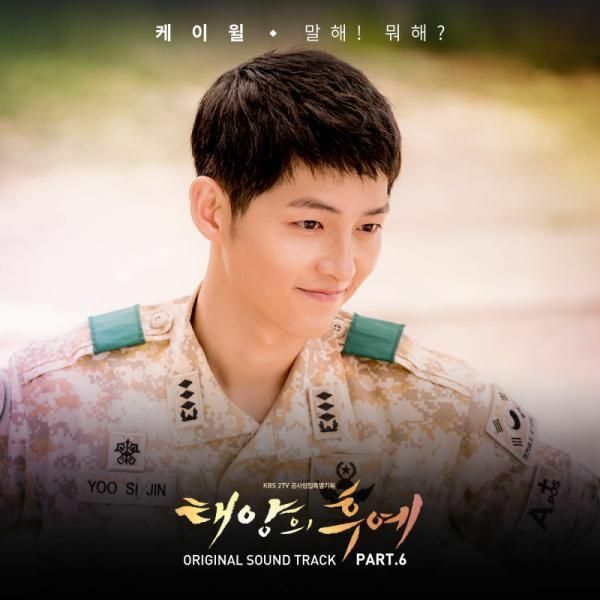 Sun Woo is laughing while Na Na is still poker faced, but she lets out a small smile as she watches Sun Woo enjoying himself. After the duet ends, Seol Chan continues to stare at Se Yi which makes her flustered and she quickly gets up and says its time to go. As they walk out, Seol Chan asks Se Yi why she changed her mind and agreed to come today? Se Yi remembered how lonely he looked in the van the first time they met, which made her realize that he may have a lot of friends being a star and all but he’s actually quite lonely. Seol Chan says Se Yi couldn’t have seen him inside the van since its window are tinted. 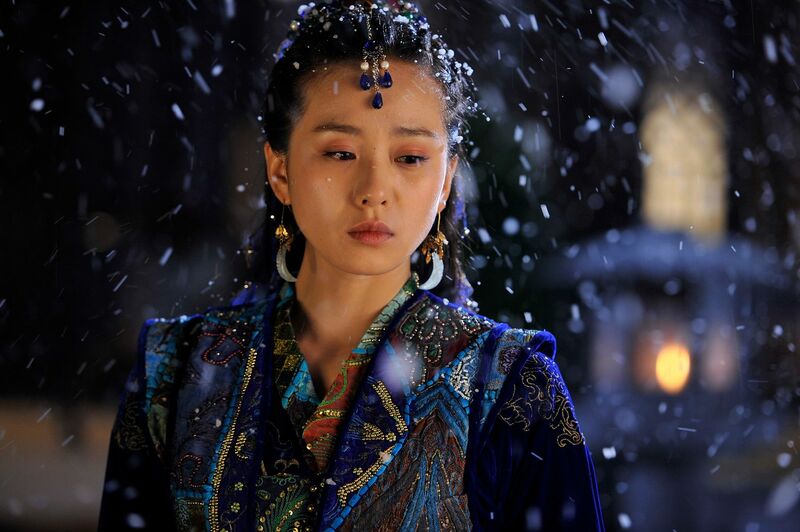 Se Yi says she could see him, if not with her eyes then with her heart. She knew he was lonely which is why she kept quiet about her taken phone that day. Seol Chan turns Se Yi’s words around and tells her to take responsibility for what she just said. Since she believes that he’s lonely and needs someone on his side, then she needs to be his girlfriend for a day. Before Se Yi can answer, a loud engine pop and a burst of smoke startles them and both turn to look at the source of the noise. When the smoke clears, suddenly Seol Chan and Se Yi are staring directly at Sun Woo and Na Na, who happen to be standing a few feet away. Both couples stare at each other, with the two men going from surprised to steely. Seol Chan is about to take a step towards Sun Woo when he hears a click and turns around to see a photographer snapping his picture. The man introduces himself as a reporter for an entertainment show and confirms Seol Chan’s identity, and then turns to ask if Se Yi is his girlfriend? She sure is pretty, and he snaps a few pictures of her. 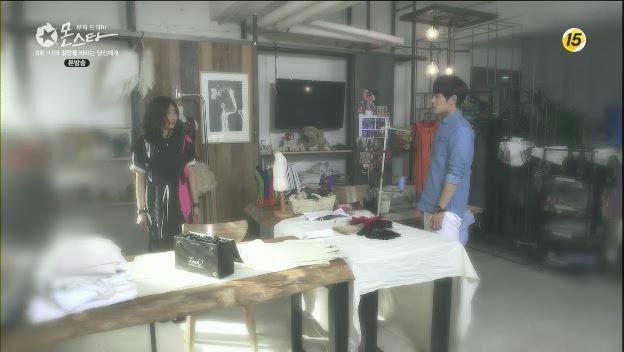 Seol Chan stares at Se Yi before declaring that she’s not his girlfriend, and Se Yi snaps her up head to stare at him. The reporter doesn’t buy it, snapping more pictures of Se Yi and addressing her directly, asking if she’s hurt by this rejection even if she understands. Seol Chan keeps insisting she’s not his girlfriend and finally can’t stand the guy taking more pictures of Se Yi and puts his hand out to cover the lens. Sun Woo is done watching from the sidelines and walks over, with Na Na staring at him. He walks up to Se Yi and forcefully pulls her into his arms and asks the reporter why he’s taking pictures of his girlfriend? The reporter doesn’t believe it but Sun Woo says Seol Chan is just treating his friends to a movie and that’s not a newsworthy event, is it? The reporter asks Se Yi to confirm whether she’s Sun Woo’s girlfriend, if so he’ll apologize. Se Yi looks at Seol Chan and then says yes, she moves to grab Sun Woo by the arm and tells the reporter that he needs to apologize because her boyfriend is Sun Woo and not Seol Chan. Seol Chan stares at her as she says this to let him off the hook. Se Yi tells the reporter to apologize to her boyfriend Sun Woo as well, how would he like it if someone said his girlfriend was someone else’s girlfriend? Sun Woo summons Na Na cover claiming she’s contacting the other team members and everyone is heading to the movies. Na Na bumps the reporter rudely as she walks over and says everyone is waiting. The reporter apologizes but doesn’t look like he bought their story. The awkward group of Na Na, Se Yi, Sun Woo, and Seol Chan trudge off to the movies, but the reporter dude continues to follow them. Sun Woo notices that Se Yi is holding a stuffed animal sheep in her hand. 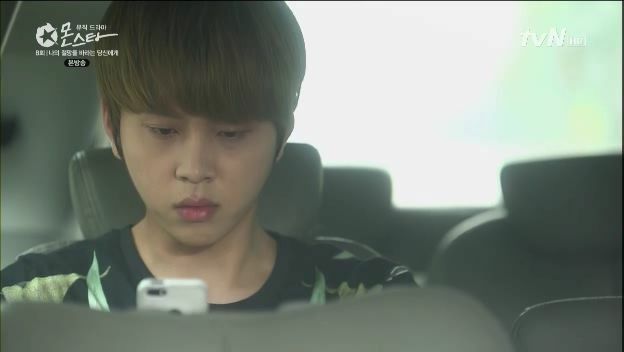 He mutters to Seol Chan that it was his carelessness that caused this whole situation. Seol Chan is NOT in a good mood and tells Sun Woo to bugger off. Color Bar reassemble at the movie theater and Do Nam, Eun Ha, and Kyu Dong are left curious why the other four are together and everyone looks so miserable. They end up watching the same movie, with only the three who haven’t seen it enjoying themselves while the rest are lost in their own thoughts. Se Yi sneaks looks at Seol Chan, while Sun Woo glances at her, leaving Na Na looking at Sun Woo. The reporter dude has followed them into the theater and observes everyone. After the movies everyone goes their own separate ways. Se Yi goes home and remembers Seol Chan asking her to be his girlfriend for a day, and then saying she’t not his girlfriend. She knows what he said is true, so why is she feeling so upset? 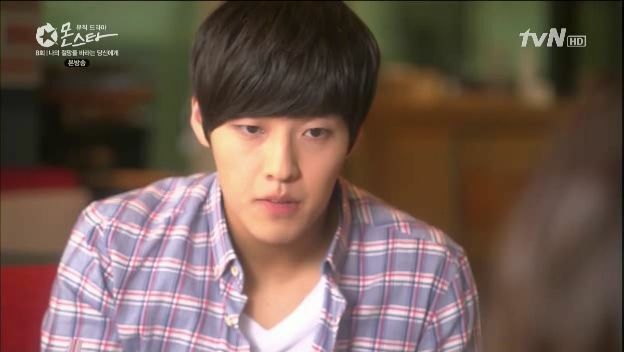 Seol Chan goes home and remembers Se Yi telling the reporter to apologize to Sun Woo. He angrily tosses his jacket over the light illuminating the framed Se Yi note, then lays down looking really upset. Sun Woo stops Se Yi on their way to school the next morning and he’s already anticipating her thanking him for what he did yesterday. He asks what she did with Seol Chan and if it was a date? Se Yi says no, claiming he was just in a bad mood and trying to make an excuse about her turning Sun Woo down first. Sun Woo cuts her off and explains Na Na asked him to hang out so he went. It made him upset to see the situation that Seol Chan put her in yesterday, but Se Yi says its not a terrible position for her. This gives Sun Woo pause, if she’s not upset about Seol Chan potentially making her an outcast if he joked around and said she was his girlfriend, then what was she so upset about? 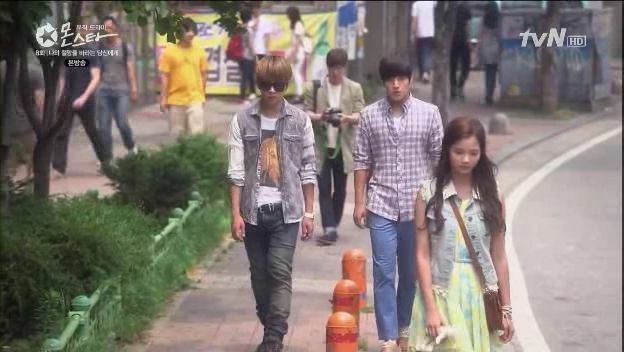 Na Na chooses that moment to literally walk right between Sun Woo and Se Yi as she heads to class. Sun Woo tells Se Yi to get an apology from Seol Chan for what happened to her yesterday. The school is abuzz with Color Bar’s performance and everyone is watching the video on their phones. Students in class compliment everyone, including surprise talents Na Na, Do Nam, and Kyu Dong. 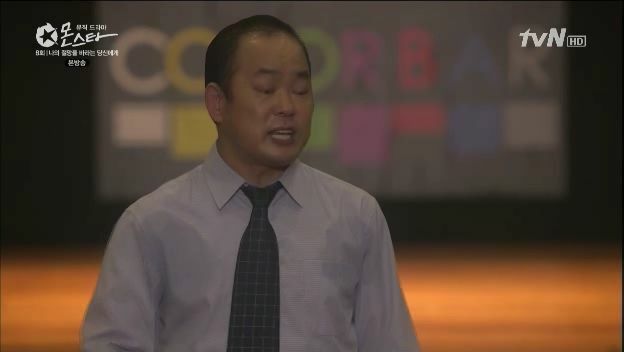 Jae Rok is furious when he hears students suggesting that Color Bar won in reality and All for One got picked because they were the Principal’s favorite. Se Yi and Seol Chan are sitting in class and he passes her a note asking to talk in his van later. They agree not to let what happened affect their partners relationship in class. Se Yi gets out of the van and leaves and Manager Hong confronts Seol Chan about getting photographed yesterday when out with her. Manager Hong asks if they are dating and Seol Chan mutters that he can’t date by himself. Manager Hong is relieved, he doesn’t care who rejected whom but Seol Chan can’t date. Manager Hong brings up the hot gossip that Se Yi is the girlfriend of class president Jung Sun Woo which pisses off Seol Chan and he storms off. Manager Hong hopes that Seol Chan gets over this no matter how painful. Jin Rok is getting more and more incensed with the students who are all complimenting Color Bar, despite Joon Hee telling him to ignore what the ignorant folks are saying. When Kyu Dong walks by, Jin Rok trips him and then mocks Do Nam for being a secret musical talent and former buddies with Kyu Dong. Eun Ha and Se Yi are sitting at the bus stop and Eun Ha is sad about her role in Color Bar being invisible and useless to the performance. 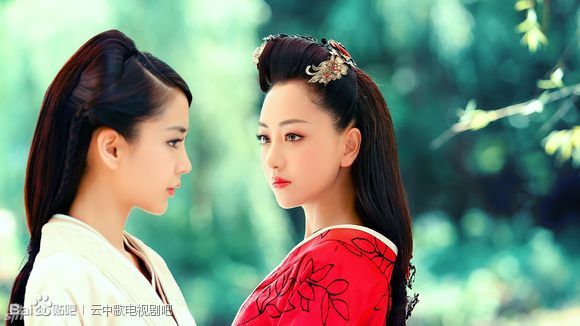 She asks Se Yi for reassurances but Se Yi is caught up in her own emotional woe and doesn’t register Eun Ha’s situation. Ji Woong goes to clean up the basement used by the kids and he can still see their presence lingering to brighten up the room. Se Yi arrives and announces that she’s been rejected. As she helps Ji Woong clean, she reveals that Seol Chan told the world she wasn’t his girlfriend, but then earlier he asked her to see a movie and they played the guitar together and he asked her to pretend to be his girlfriend for a day. He keeps confusing her, but she doesn’t know why she’s so sad about his rejection when she doesn’t like him. Ji Woong and Se Yi move the piano inside, he doesn’t know how to play but had one here for others who did. He asks what she feels about Seol Chan? Se Yi doesn’t know, she’s sad but she doesn’t think she likes him. Perhaps she’s just confused by all his actions recently. She announces that when one gets rejected its haircut time so she drags Ji Woong along. They two of them sit for a haircut, which only Ji Woong cuts while Se Yi gets a trim and some bangs. She doesn’t want to cut her hair so Ji Woong’s getting the haircut in proxy for her. As they walk back, Se Yi reveals she’s been wanting him to get a haircut and now he got one and for good reason. She promises to move on past these feelings so as to not waste his haircut. As Ji Woong walks home he passes by a woman and both of them stop and turn around. It’s Se Yi’s mom and they recognize each other. He speaks first, hearing that she was in New Zealand. Se Yi’s mom looks pained and then turns and leaves without answering him. Se Yi’s aunt watches her pack in a hurry and calls her out for being an immature little snot, trying to avoid her mom and stay angry at her. 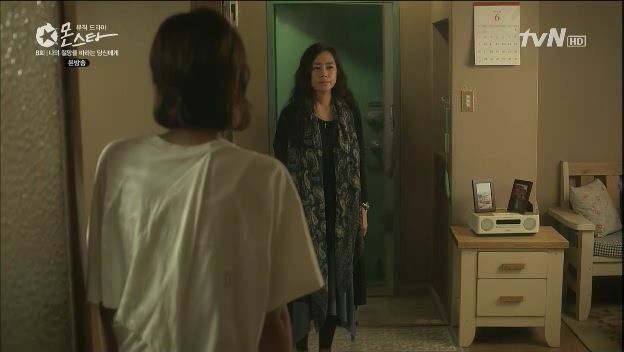 Se Yi’s mom enters the apartment and is happy to see Se Yi and that she is doing well, but Se Yi just yells at her for coming and ruining her plans to avoid her forever. Se Yi’s mom grabs her bad so Se Yi just runs out with her guitar case. Se Yi’s mom chases her and yells her to leave when its morning time at least. But she’s not going to make it easy, she’ll chase Se Yi everywhere because she’s not losing her only daughter. 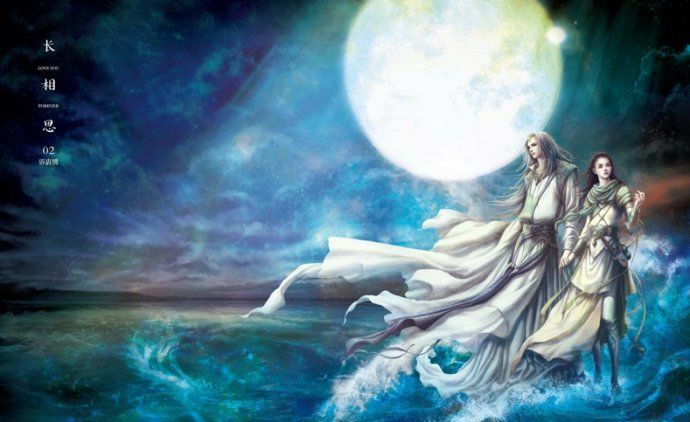 That night, Se Yi lays in bed and tosses and turns. A split screen shows up Seol Chan doing the same thing. My poor babies. The reporter is at school showing Se Yi’s picture around and trying to find out who she is and what her relationship is to Seol Chan. Is she Seol Chan’s secret girlfriend? Hyo Rin walks by and goes over to announce that she’s Seol Chan’s girlfriend. She reveals her name and her dad being some rich Chairman Ma and that gives the reporter pause. 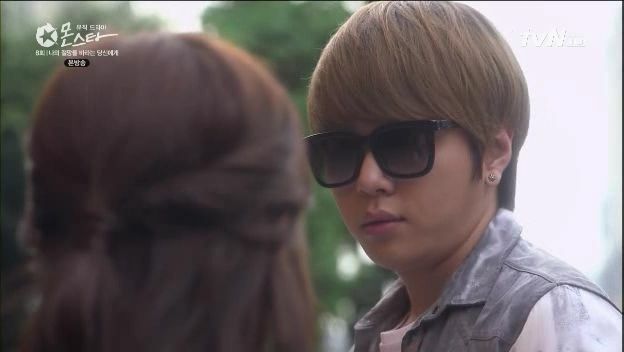 She tells him to not to associate her Seol Chan oppa with that crazy girl. Sun Woo is walking to class when he spots Se Yi in the hallway with Seol Chan ahead of her. He calls out her name which gets Seol Chan’s attention as well. He compliments her new bangs and then asks if she got that apology from Seol Chan. Se Yi says yes while Seol Chan is upset and says that has nothing to do with Sun Woo. Se Yi turns around and says Seol Chan needs to be grateful to Sun Woo for helping. This hits a double sore spot for Seol Chan who says when someone doesn’t want help then what Sun Woo did is an imposition, not a kindness. Looks like that is what happened between them in the past. 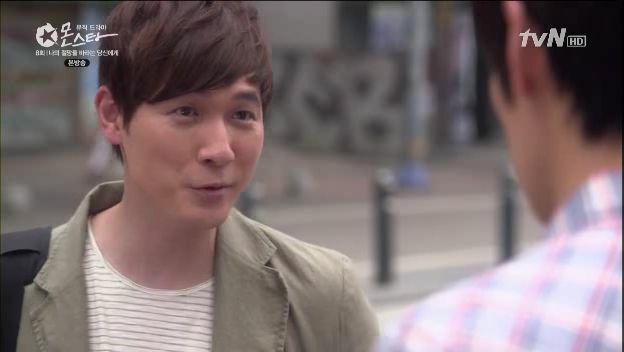 Sun Woo pipes up and says what he did wasn’t motivated by kindness and Seol Chan knows it. Se Yi looks confused and Sun Woo drops the bombshell that he likes Se Yi, leaving Seol Chan angrily yelling a him. Seol Chan turns and storms off while Se Yi stares at him and then looks at Sun Woo. Seol Chan goes to class but he’s so angry he heads back out. 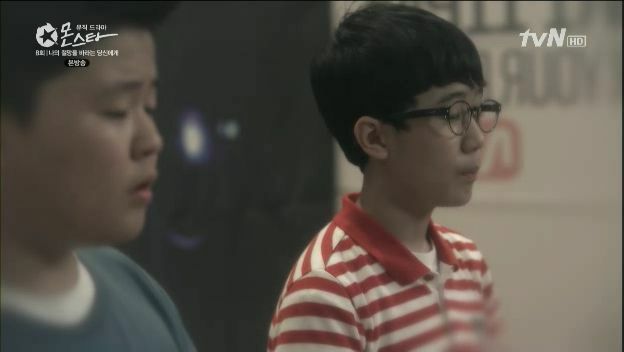 Some students are being nice to Kyu Dong but Jin Rok returns to his bullying ways and asks him to sing. He refuses and leaves, along the way asking to speak with Do Nam. Jin Rok sees this and follows. Kyu Dong gets on his knees and begs forgiveness from Do Nam. He’s been wanting to do this for years but never got up the courage, in fact he’s never been brave enough to do anything. Do Nam says that is right, Kyu Dong isn’t courage, all he has is selfish greed. Flashback to child Kyu Dong and Do Nam, the kids are performing duet with Do Nam beatboxing and Kyu Dong singing in front of judges at an audition. They call themselves brothers despite not being related because they are so close and loyal. But when a judge asks what if only one of them can move on, Do Nam says he won’t go without Kyu Dong, but Kyu Dong doesn’t make the same promise. The judge says there is a dance program that Kyu Dong can participate in. 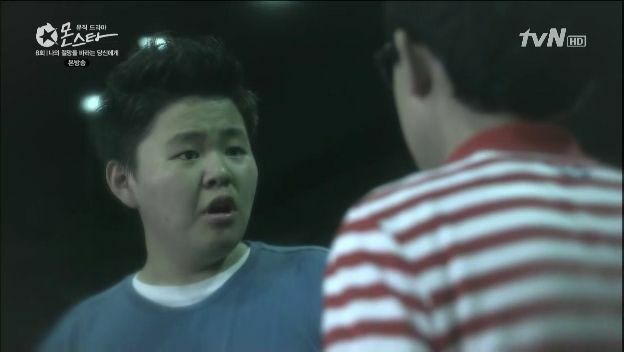 Do Nam leaves the audition angry at Kyu Dong for his betrayal. Kyu Dong tries to explain but Do Nam doesn’t listen. As Do Nam shakes off Kyu Dong, he loses his balance on the top of the stairs and topples down. He ends up injured and that ends his judo aspirations. Do Nam says that while he was laying in the hospital recovering, he watched Kyu Dong in that program but he got cut in the first round, and that he deserved it. Do Nam will accept Kyu Dong’s apology if can give him back his judo career, otherwise get lost. Jin Rok hears all of this. Seol Chan is wandering around school and angry that Sun Woo confessed to Se Yi in front of him. He wonders what they talked about after he walked away, worrying that they may have already become a couple. Sun Woo is helping the teachers and one notices that he seems different, more manly these days. Sun Woo smiles. Kyu Dong walks back to class to find all the students have turned against him because they heard from Jin Rok, who laughs and says this is karma and payback. Do Nam walks in and Jin Rok says everyone is on his side, but Do Nam just leaves. Jin Rok taunts Kyu Dong that the applause was for Seol Chan and not him, he’s forever going to be radio. Kyu Dong asks to sing a song and does so with tears pouring down his face. He leaves when he’s done. Se Yi is walking in school thinking about what Sun Woo said earlier. Kyu Dong’s paper plane sent from the roof lands on her and she starts to fret about him. Kyu Dong stands on the ledge and apologizes to his parents but finally now he has to courage to take that one extra step and put all this pain away. Kyu Dong sees Se Yi trying to call his cell and he apologizes to her as well and throws his cell away. Se Yi happens by as the cell phone falls and she looks up to see Kyu Dong standing on the ledge of the roof and she starts to fully freak out. Se Yi runs headlong into Seol Chan as she’s trying to save Kyu Dong. Seol Chan sees her tear streaked face and asks with utter shock and worry what happened. Se Yi can only cry and we see Kyu Dong take one step forward over the ledge. The SC/SY date and duet was so lovely and cute before the reporter showed up. But then…watching KD sing “I’m not all right at all”, with tears streaming down his face, while his classmates mock and taunt him, nearly gutted me. And what is up with EH and her bruise? Just to point out, that hyorin’s father own sthe company the reporter works for. Something that this show does, which I find different from most Korean dramas is show how intense yet simple High School is. I mean I know how it feels to like a boy and not know it, and at that same time I’ve dealt with a friend who felt the world was against her and she just wanted to end all her suffering. It’s a sad but well need version of how teenagers are viewing the world in this generation and each actor/actress does a fine job portraying the right feeling and emotion for each scene. Thanks for the Recap I look forwards to next weeks! 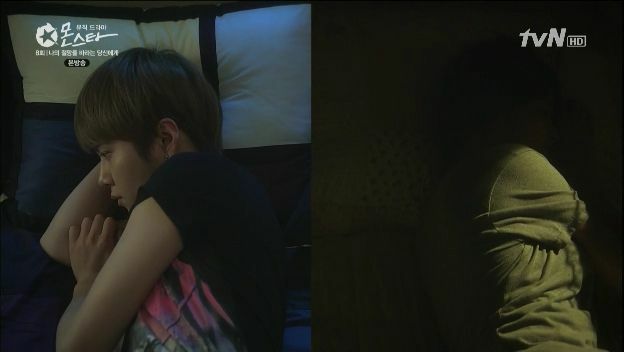 I think Do Nam saw Kyu Dong too… I hope he will save him. Actually, i thought Yong Jun Hyung’s voice was a bit uneven at first when he started singing — you could tell that he’s more of a rapper and hasn’t practiced his vocals as much. But once his voice joined in with se yi’s, my heart was exploding with OTP goodness. They’re so wonderful together! I think the writers should start fleshing out more of eun-ha as a character because everyone’s pretty much had their moment to shine but her. And i like that they pointed out how people still found her as “invisible” even though the girl was extremely happy to be performing with color bar. I also wish that she would have stuck up for kyudong when he was being bullied because being a bystander is just as bad, and aren’t they closer now? I actually like the backstory behind do-nam and kyu dong because it’s not overly dramatic but it’s just enough to get us to understand the current state of their relationship. Do-na has dam good reason to feel betrayed — i understand why he doesn’t want to get close with kyu-dong — but kyudong seems to have already been punished enough, dontcha think? He needs friends more than anything right now. My poor baby on the ledge! I wish se-yi thought quicker on her feet. Sometimes i find her really slow(yes, that’s consistent with her character) but the kind where i just want someone to knock her upside the head and tell her to LOOK WHATS RIGHT IN FRONT OF YOU. Starboy is obviously head over heels in love with you, and given the situation with the reporter you should know why he couldn’t admit you were his girlfriend or whatever. This was a nice episode. Not that many in your face musical numbers but rather understated(seol chan/se yi duiet) and heartbreaking(kyudong). Thanks for the recap! 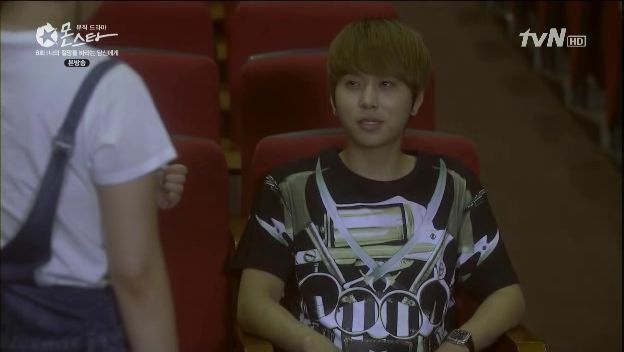 Junhyung is really very talented (sings, raps, produces music, plays instruments). I am a bit biased of course being a fan of B2ST but I am glad that people are seeing that right now. Awesome recap! Being a fan since their debut, i’ve always known the boy could sing. But now, junhyung’s become a jack of all trades since it’s just about everything: dancing (he used to bboy AND pop before Beast), rap, sing, produce, compose and now add acting to his resume. This episode left me feeling mixed and super unsatisfied. I felt that the cute date was just too short and it had too much sunwoo/nana mixed up in it. Can’t our main couple have 5 minutes of uninterrupted time?! sigh. Waaa thanks koala! So many happenings in this ep. But can i just say that the movie is Werewolf boy and not Covertly Grandly right? yeah, it’s Werewolf Boy, you can hear the name ‘Chul-soo’ from the screen when the rest of the gang are watching it. This show is just great so far, and even though the cast is really green, the writers (there are two, and one is the writer of my all-time fave, Arang and the Magistrate) have been almost pitch-perfect with every ep. I can’t believe there are only four episodes left now, though! 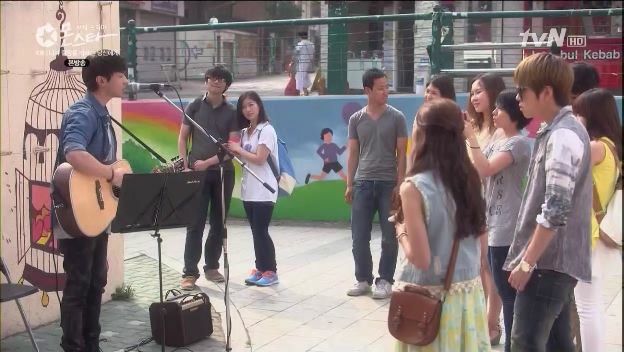 Babies Seol Chan and Se Yi’s duet was so romantic! No skinship just music and a lot of staring.They’re the cutest! (Ha Yeon Soo) Min Se Yi is beautiful. Exactly my type, off-screen and on-screen. I watch this drama; she’s fifty percent of the reason for why I do. Does anyone know the name of the singer and song that se yi and sun woo sang at then end of episode 2?